This Galapagos active adventure is the first of its kind offered in this tropical archipelago--and now it's better than ever! Ours is the only adventure that gives you the opportunity to camp on island beaches as well as explore the rim of a recently active volcano. Witness the wonderful wildlife of these islands up close and personal from the seat of a kayak versus onboard a cruise, providing you a more intimate journey in the enchanting Galapagos Islands. 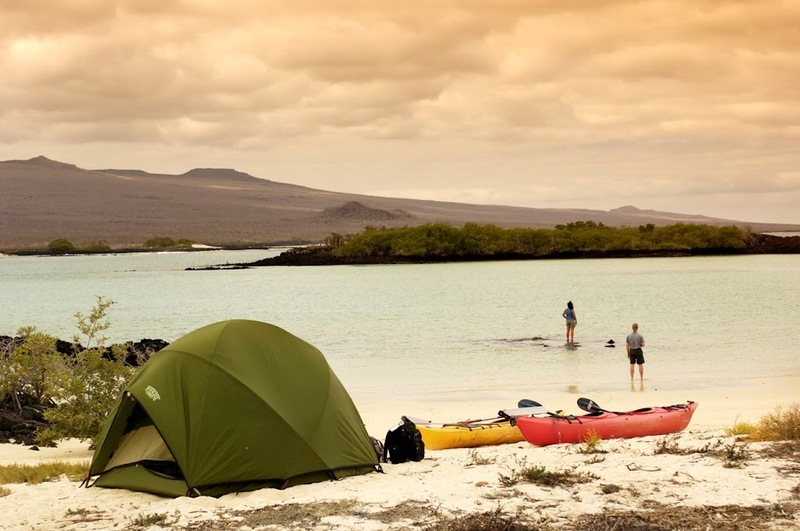 So come to the Galapagos Islands with sea kayak paddle in hand for a multisport adventure! Marvel at the oceanic geologic origins, rich sea life, diverse wildlife and intriguing natural history of the islands, all of which are unique on this planet. Our Galapagos Island Sea Kayak, Snorkeling and Hiking Adventure allows you to discover them on an intimate level. Leave the crowds of visitors and the well-worn paths behind to enjoy the peace of walking and paddling our way through this island paradise. Few places on earth allow for such intimate contact with a dazzling array of wildlife as the Galapagos Islands. Words cannot describe the intense wonder of exploring these oceanic islands where the birds and animals have little or no fear of humans. Swim with sea lions, and get within a few feet of blue footed boobies, marine iquanas and the giant Galápagos tortoises. Watch pelicans dive for fish, snorkel in transparent water rich with fishes and, if you desire, swim with sharks. Our sturdy, speedy, and stable expedition sea kayaks are for one or two paddlers and are specifically equipped for the conditions we encounter. All kayaking portions of the trip are supported by a panga, or small motorboat, to ensure everyone's comfort and safety. Although participants should have some paddling experience, we begin with practice and safety instruction. Our camping sites are approved, and we adhere to leave-no-trace ethics in all our excursions. Activities include: walking, hiking, snorkeling and sea kayaking. The Galapagos Islands have been a national park of Ecuador since 1959 and the islands remain a far-flung destination. These remote islands are revered the world over for their famous natural history and remarkably friendly, utterly unique creatures. In the effort to protect and preserve the Galapagos, access to the islands is restricted and regulated. Most tours to the Galapagos are cruise based tours set on yachts carrying from ten to ninety people. This unique journey, the only one of its kind, allows our small groups to visit sites that are not on the main routes and also lets you explore in the most environmentally-friendly manner imaginable--under your own power. We walk and sea-kayak where other, more intrusive modes of travel would not take us, and our reward is not only what we see but the pleasure of getting there. Our itinerary takes us to five islands that include a wealth of wildlife and ecosystems. Every journey is more than its destination, and we are thrilled to offer an experience in the Galapagos for those intrepid and indefatigable souls who come along with us. Fly into Quito on mainland Ecuador, where you're greeted by a SKA representative who assists you with your luggage and transfers you to the hotel for your overnight stay. If you have time, explore some of mainland Ecuador's historic sites and tasty cuisine before bed. Enjoy your first morning in Ecuador with a day exploring Quito, a UNESCO World Heritage Site. Quito is home to many ancient, colonial and modern wonders including the colonial monasteries of Santo Domingo and San Francisco as well as sprawling colonial temples. Peer into Quito’s past with visits to the Independence Plaza and neighboring Jesuit Church La Compañía, the St. Augustine Covent. the Municipal Building, the Archbishop’s Palace and the Presidential Palace. Up next, gaze up at the elaborate interior of the Church of San Francisco—a stunning remnant of the New World. Relax with some lunch, after which you continue to SKA’s Ecuador headquarters. Sample some delectable Ecuadorian chocolate and gather for a trip and kayaking orientation. Mid-afternoon finds you back at your hotel, where you can relax or do some more exploring before dinner. In the morning, fly from Quito to San Cristobal Island, the easternmost island in the archipelago. One of the oldest in the chain, San Cristobal's volcanic peaks are greatly eroded but the island boasts more abundant vegetation than many of the others in the archipelago. Upon arrival in the provincial capital and second largest town in Galapagos, Puerto Baquerizo Moreno, we have our lunch at a local restaurant. Here you also have the chance to try the snorkeling and wet suit equipment. This afternoon, set off on your first Galapagos sea kayaking excursion with a 6-mile paddle from Puerto Baquerizo Moreno to Manglecito Beach. Pass by Lobos Island as you paddle and look out for the blue-footed boobies and brown pelicans hopping along the rocky coast where marine iguanas bake in the sun. Sea turtles can occasionally be spotted dipping their heads out of the water for a quick break, or even mating, along this route. Our paddle takes you to our prepared beach camp, where you may choose to soak in the views and settle into your tent or set out on one of our SUP boards to explore the becalmed bay and the wildlife found there. As the sun sets, relax with a fresh, delicious dinner, 360˚ views and a secluded beach where wildlife are the only passersby. Today we take our kayaks and paddle along the coast, traveling to our camping area from Puerto Grande, another gorgeous beach. On arrival, relax with lunch and enjoy some bird watching and beach time. After, hop aboard a catamaran to Kicker Rock, or Isla Leon Dormido. En route we may encounter porpoises! Then we begin an amazing snorkeling experience during which we may see Galápagos and white-tipped reef sharks, eagle rays and sea turtles. We see hundreds of fish and sea stars. Return to relax on Manglecito beach by late afternoon and enjoy our last night at camp. After breakfast, take some time to explore the area before taking a boat back to town. There, we meet our flight to Isabela Island. This seahorse-shaped island is the largest in the archipelago and was formed from 6 merged shield volcanoes. Despite its remarkable beauty, Isabela is not a stop on most Galapagos cruises, making it a less-visited site perfect for our adventures. Because it is a relatively young island, Isabela’s lava fields and surrounding soil do not have the varied vegetation zones of other islands. Despite this, the rich animal, bird, and marine life are beyond compare. There are more wild tortoises here than on all the other islands combined, and they roam freely in the calderas. Upon arrival on Puerto Villamil, Isabela’s main town, we check into our accommodations and enjoy some lunch at a local restaurant. After, settle into your kayak for a paddle along Isabela’s stunning bays and beachfront. Wildlife abounds—especially the elfin Galapagos penguin who love to hop around the volcanic rocks here. Snap on your snorkel gear for a better view of the sandy sea floor or take to a stand up paddle board to navigate the bay. After breakfast this morning we drive to the highlands of Isabela for an entirely new view and feel of the Galapagos. Reach the base of Sierra Negra, which last erupted in 2005, and set off on a 6-10 mile hike through the new and dramatic layer of lava accompanied by plenty of birds such as flycatchers, finches and possibly the evasive Galapagos hawk. Our hike takes us to Isabela’s caldera—the second largest in the world with a diameter of 6.5 miles—where you can catch your breath and magnificent views. After our excursion, return to town. Some may enjoy a walk to the beach for a cool swim, or a stroll in town before gathering for dinner. Enjoy beachfront BBQ served with views of a Galapagos sunset and a toasty bonfire tonight. In the morning, weather permitting, we take a boat ride to Los Tuneles: a most curious and remarkable lava formation consisting of arches and caves. Walk along the shore and snorkel in crystal clear water for a glimpse into the remarkable underwater world. Enjoy lunch aboard the boat before continuing on to nearby El Finado, where you discover an inlet used by local fishermen to rest from their journeys in the ocean for years. Snorkel among white-tipped reef sharks, stingrays and colorful tropical fish flitting amongst submerged lava rocks forming caves and small reefs. Spend the afternoon on land with a visit to the Tortoise Breeding Center, where you can see the Galapagos’ titular tortoises at all stages of growth. Learn about the Galapagos National Park’s conservation efforts and witness the gentle creatures up close. Return to our accommodations through the wetlands, where flamingos stand bright against the four different species of mangrove that grow in the tidal lagoons. Spend your evening strolling along the beautiful white sand beach of Puerto Villamil and exploring the town on your own. We wake early and set off for the day’s adventures by sea. We take a speed boat to Isla Santa Cruz, the urban center of the archipelago and the home of the Darwin Research Station, the National Park Headquarters, and Puerto Ayora. Once we land, drive on Santa Cruz’s main highway into the lush ecosystem of highlands. Wild Galapagos tortoises lumber throughout these dense forests, and we spend some time walking amongst them as they chew on the vegetation and roam slowly through the diverse environment. After our time with the tortoises, we visit some of Santa Cruz’s lava tunnels created as hot lava once snaked throughout the earth’s crust. We explore the labyrinth of subterranean twists and marvel at the force of nature before returning to the surface. As the afternoon continues, we find our way to white-coral beach and a nearby shallow lagoon where hop into our kayaks. Watch for sharks, rays, and seabirds as we paddle along the coastline or flamingos enjoying the calm waters of the lagoon. Later, we return to the hotel where you have some time to rest. You are free to enjoy dinner on your own either at the hotel or take a water taxi and explore the town. Puerto Ayora is a bustling town with lots of dinner choices and the opportunity to enjoy the local night life. After breakfast at your hotel, enjoy a scenic drive to El Garrapatero, with the opportunity to visit a coffee farm in Bellavista that also produces sugar the old-fashioned way. Learn how sugar cane juice is extracted before being transformed into “Galapagos Moonshine”. Then continue to the beautiful beach of El Garrapatero where you can relax on the sands, take a dip or go kayaking to explore the nearby mangroves. In the evening, you’ll be treated to a delicious dinner featuring traditional ingredients with a local angler as you experience authentic Galapagos hospitality. Begin your morning with a journey to Baltra, where you catch your flight to mainland Ecuador and say goodbye to the Galapagos Islands. Once in Quito, you may meet your return flight home or stay on with an extension tour to delve into Ecuador’s rich Incan past or Amazonian ecosystems. On this tour, you should arrive on day one of the itinerary. This is included as a travel day to ensure all guests in the group are checked in and ready for the Quito city tour on day two. All of the kayaking and camping equipment is provided, so just bring your clothing and personal gear. A complete pack list is available here. We highly suggest traveling “light” for this adventure, as the domestic flights limit the amount of luggage to 35 lbs per person. Both tours offer camping on San Cristobal. The Galapagos by Kayak trip visits fewer islands and there is more time spent kayaking than on the multisport trip. Both are superb journeys offered by no other company and we invite you to call our office to help you decide which trip would be best for you. You see roughly the same number of species of animals on either trip.